The battery energy storage system market was valued at USD 747.61 Million in 2015 and is expected to grow at a CAGR of 37.0% between 2016 and 2022. The base year used for the study is 2015 and the forecast period is between 2016 and 2022. 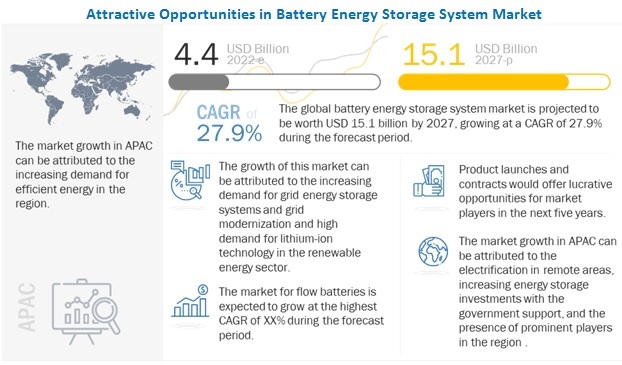 This report provides a detailed analysis of the battery energy storage system market segmented on the basis of battery type, connection type, revenue source, ownership, application, and geography. The increasing demand for grid-connected solutions and growing electric vehicle market is expected to impact the market in the future. The ecosystem of the battery energy storage system market includes the raw material provider and component manufacturer, battery energy storage system manufacturers, system integrators, and distributors. The key players in the market include ABB Ltd. (Switzerland), AEG Power Solutions (The Netherland), General Electric Co. (U.S.), Hitachi ltd (Japan), LG Chem. (South Korea), NEC Corporation (Japan), Panasonic Corporation (Japan), Samsung SDI Co., ltd. (South Korea), Siemens AG (Germany), and Tesla Motors Ltd. (U.S.) among others.